Heat the oil in a large skillet (I use non-stick) over medium heat. Add the onion and sauté until translucent, about 5 minutes. Reduce the heat to low, add the garlic and sauté, for about 1 minute. Add the mushrooms and sauté, for 2 minutes more. Stir in the marinara and coconut cream. Bring the heat up to medium for just a minute to get the sauce bubbling slightly, reduce it to low, and allow the sauce to simmer while you make the gnocchi. Make the gnocchi according to the package directions. Once the water is boiling, this step only takes about 3 minutes as gnocchi cooks very quickly. Divide the gnocchi between 4 to 6 bowls. Add salt and pepper to your sauce to taste. Turn off the heat, and stir in the basil. Pour the sauce equally over the bowls of gnocchi, and if desired, garnish with a few ribbons of basil. Coconut Cream: You can buy coconut cream (not creme of coconut) or simply skin the cream from a can of chilled, full-fat coconut milk. I use So Delicious brand as it sets up into a nice thick cream. 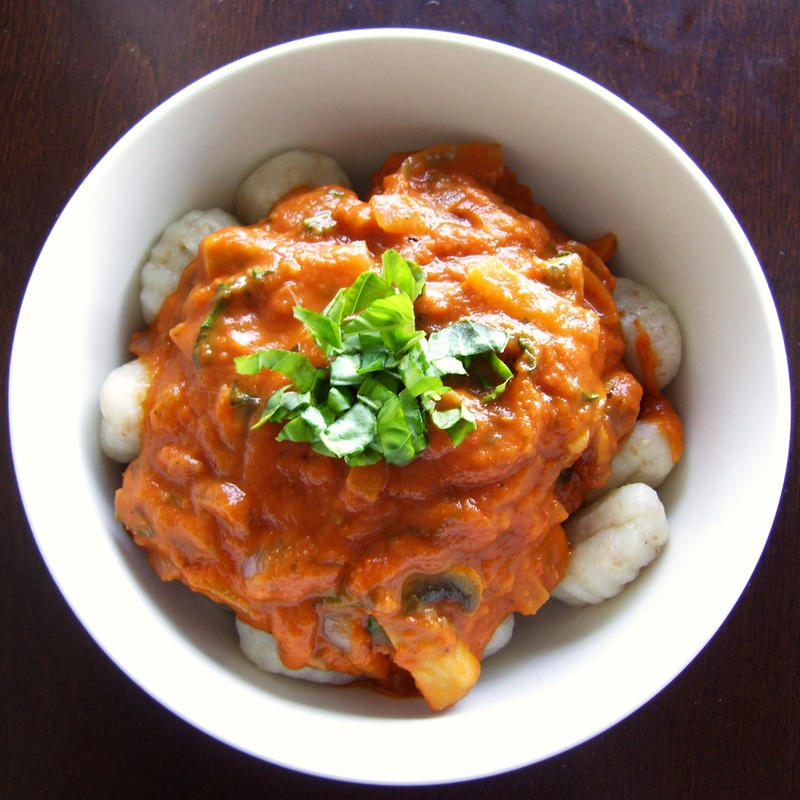 Gnocchi: Some brands of gnocchi do contain dairy in some form, but there are many dairy-free brands. Don Bruno Gnocchi is vegan and Bartenura Gnocchi is even kosher parve. Conte's Gnocchi is dairy-free and gluten-free. Zucchini Option: For some extra greenery, halve and slice 1 to 2 zucchini into ¼-inch half circles. Increase the oil to 1½ tablespoons and add the zucchini slices with the mushrooms.